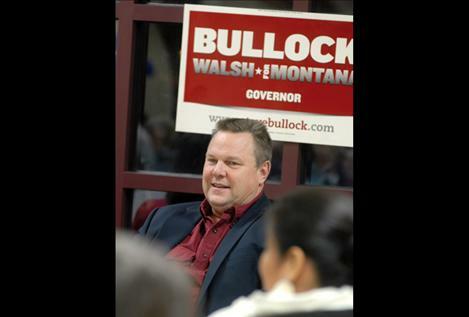 Waiting his turn to talk to the crowd at the Nov. 1 rally, U.S. Sen. Jon Tester takes a look at the audience. 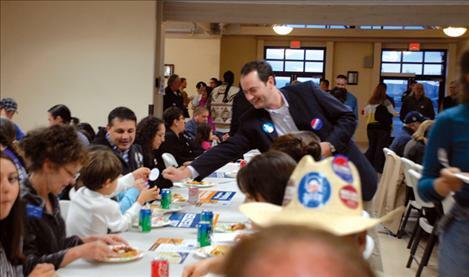 Attendees at a Democrat rally feast on Indian tacos and pumpkin pie before hearing candidates who were on a three-day trip to all Montana’s Indian reservations. 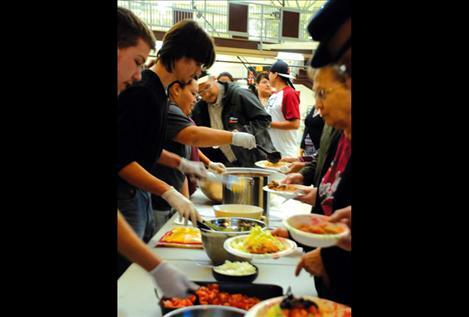 PABLO —At the end of a three-day, whirlwind tour of Indian reservations in Montana, Democratic candidates and their supporters rallied at the Joe McDonald Health and Fitness Center on Nov. 1 for an Indian taco dinner. Salish Kootenai College student volunteers and the Montana Democratic Party put on the dinner and rally. 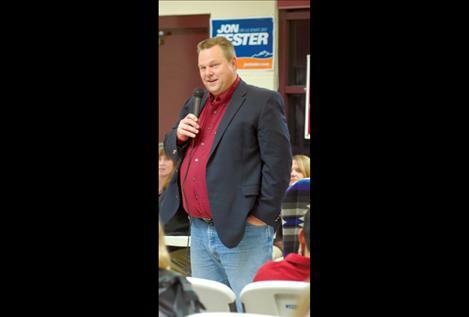 Senator Jon Tester, in a tight race against Republican challenger Rep. Denny Rehberg to retain his senate seat, spoke to the crowd. Other candidates present were Montana Attorney General Steve Bullock, running for governor; Pam Bucy, seeking Bullock’s job as Montana Attorney General; Denise Juneau, seeking re-election as State Superintendent of Public Instruction; Kim Gillan, vying for U.S. Representative; Linda McCulloch, running for re-election as Montana Secretary of State, Monica Lindeen, trying for a second term as state auditor; local candidates Nancy Lindsey, opposing Janna Taylor for Senate District 6, and Joey Jayne, running for Lake County Justice of the Peace; and Shannon Augare, the Democratic Senator for Senate District 8. The main message from all the candidates was to get out and vote, since there are so many close races.